Pull up a Chair, Soup's Ready! Welcome to the 3rd reveal of the 7th Annual Bead Soup Blog Party! Before I begin with my reveal, I want to thank our hostess Lori Anderson for all of the work she has done for this event. Faced with terrible pain and health concerns, she still managed to get all 500+ participants organized and worked diligently to keep this party going. Thank you, Lori, we appreciate and admire you more than you realize. When I started the design process, I had planned on mounting the finished embroidery onto a brass blank, but instead I just lined it with black ultra-suede and added a silver clasp from my stash. I am IN LOVE with this bracelet and very proud of myself for completing it. 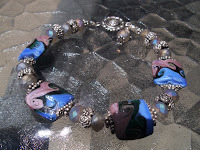 Because it was so time-intensive (and I seriously doubted I would be able to finish it in time for the reveal), I decided to use the lovely lampwork that was in the ingredients to make this bracelet, you know, just in case. I added the glass rondelles and used the silver accents clasp that were in the mix. 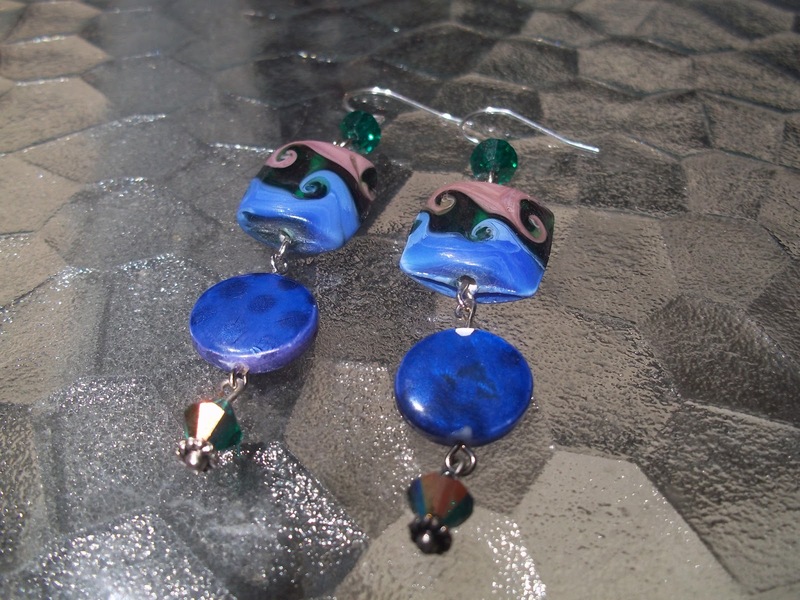 I also made a pair of dangling earrings, adding the round blue ceramic beads that Suzann included in the mix of soup ingredients. I wired them together with some emerald ab crystals (it's hard to tell from the photos, but the center of the lampwork beads are clear, emerald glass -- amazing) from my stash finished them with simple sterling fish hook ear wires. I'm really happy with this set, too. 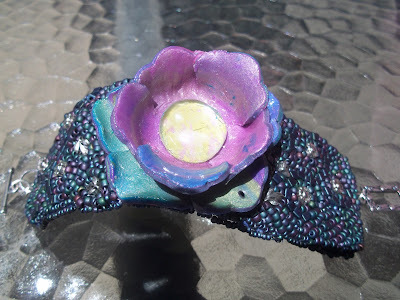 It's amazing to me how much my skill level has improved since participating in this blog hop! I still had quite a bit of cultured sea glass (in fact, I sent some to Suzann in her soup ingredients) left over from the Znetshows design team challenge that paired wonderfully with the (huge) strand of shell chips that Suzann sent. I made this bracelet and earrings to match with those components and some tiny crystals. Until just this minute, I hadn't realized that I used copper findings in the bracelet and silver for the earrings. Oh well, separates! Because of that little whoops, I am going to give the earrings to one of the people who take the time to comment on this post. If you'd like the earrings, come back next week to see if you have been chosen. In fact, if you like my facebook page or become a new follower here, let me know that you have and I will enter you twice. So, there you have it. My designs. I'm really proud of my work this time around. 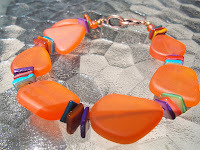 It might sound like a bit much to some, but the Bead Soup Blog Parties have changed my life. 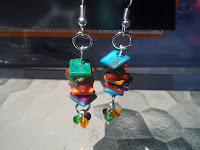 I've been made a member of the design team for Znetshows and I've been challenging myself more and have been focusing on my finished pieces instead of bead making. 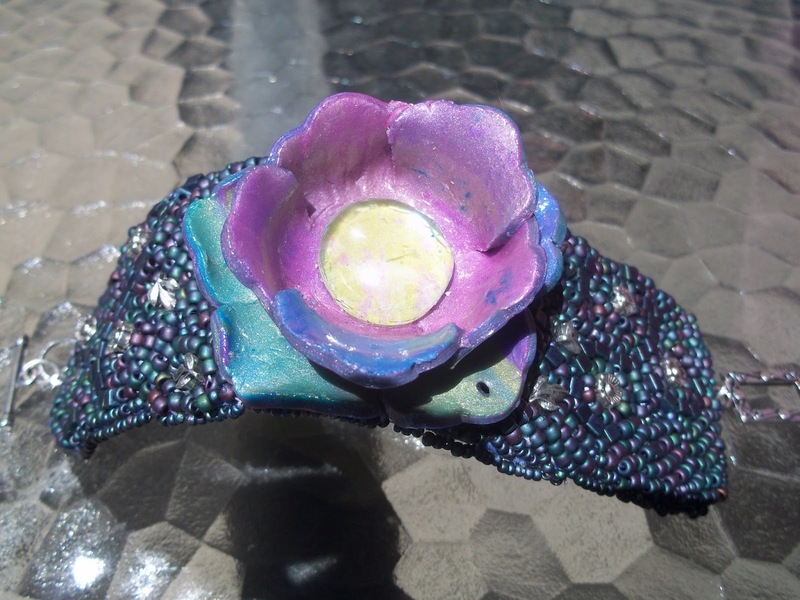 In fact, I will be showing at a Summer Art Walk in Monrovia this year, and I am in the development stages of a new way to offer my pieces for sale online (instead of etsy). If any of my readers have any advice for me, I sure would appreciate it. I am honored to be among the 500+ talented designers who have participated in this event. Please take some time to visit the other artists who have contributed their stash and designs to this wonderful event. You can begin here, with Suzann and then continue with the list, available here. All of these designs will be available for sale within the next couple of days. Please come back and visit next week, if you are interested. Thanks again for stopping by, pour yourself a beverage and enjoy some more soup!